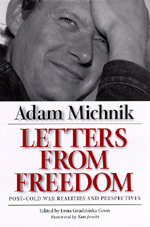 A hero to many, Polish writer Adam Michnik ranks among today's most fearless and persuasive public figures. His imprisonment by Poland's military regime in the 1980s did nothing to quench his outpouring of writings, many of which were published in English as Letters from Prison. Beginning where that volume ended, Letters from Freedom finds Michnik briefly in prison at the height of the "cold civil war" between authorities and citizens in Poland, then released. Through his continuing essays, articles, and interviews, the reader can follow all the momentous changes of the last decade in Poland and East-Central Europe. Some of the writings have appeared in English in various publications; most are translated here for the first time. Michnik is never detached. His belief that people can get what they want without hatred and violence has always translated into action, and his actions, particularly the activity of writing, have required his contemporaries to think seriously about what it is they want. His commitment to freedom is absolute, but neither wild-eyed nor humorless; with a characteristic combination of idealism and pragmatism, Michnik says, "In the end, politics is the art of foreseeing and implementing the possible." Michnik's blend of conviction and political acumen is perhaps most vividly revealed in the interviews transcribed in the book, whether he is the subject of the interview or is conducting a conversation with Czeslaw Milosz, Vacláv Havel, or Wojciech Jaruzelski. These face-to-face exchanges tell more about the forces at work in contemporary Eastern Europe than could any textbook. Sharing Michnik's intellectual journey through a tumultuous era, we touch on all the subjects important to him in this wide-ranging collection and find they have importance for everyone who values conscience and responsibility. In the words of Jonathan Schell, "Michnik is one of those who bring honor to the last two decades of the twentieth century." Adam Michnik is the editor of Gazeta Wyborcza, which he helped to found in 1989. Many of his articles and essays have been translated into other languages, but except for the translation of a 1979 work, The Church and the Left (1992), this is the first collection of his writings to appear in English since Letters from Prison and Other Essays (California, 1986). Irena Grudzinska Gross is the author of The Scar of Revolution: Custine, Tocqueville, and the Romantic Imagination (California, 1991). Jane Cave is the translator of several books from Polish, including Konspira by Maciej Lopinski, Marcin Moskit, and Mariusz Wilk (California, 1990). Ken Jowitt is Professor of Political Science at the University of California, Berkeley, and author of New World Disorder: The Leninist Extinction (California, 1992), among other books.